Tickets for the OneRepublic, Tori Kelly, and Gwen Stefani shows are not available at this time. You may secure a maximum of (2) complimentary tickets to one of the three shows on Friday, July 8 and Saturday, July 9 at San Diego's Embarcadero Marina Park South. Tickets are general admission standing room only. Based on available inventory, tickets for these events are available on a first come first served basis and are not guaranteed. These concert tickets are a bonus addition to any All-Star game strips that you may have already purchased. Saturday Tori Kelly 10:30 a.m.
Saturday Gwen Stefani 5:30 p.m. Note: Parking will be limited during All-Star Game events. From North - take I-5 south, exit Front Street, drive south to Harbor Drive, turn left, proceed to Park Blvd. (just past Convention Center), turn right, parking on your left. On occasions of heightened Downtown activity, we recommend avoiding Downtown traffic by proceeding farther down I-5 to the Cesar Chavez Parkway exit. Take a right on Cesar Chavez, proceeding SW to Harbor Drive. Turn right, proceed to Park Blvd. (just before Convention Center), turn left, parking on your left. Patrons coming down Hwy 163 should take the I-5 south exit before downtown, then once on the 5, take the Chavez exit as noted above. Patrons coming down I-15 should exit to Hwy 163 south and proceed as above. From South - take I-5 north, take the Cesar Chavez Parkway exit, turn left, drive SW to Harbor Drive, turn right, proceed to Park Blvd. (just before the Convention Center), turn left, parking on your left. From East - take King/Hwy.94 west toward downtown. Before coming into downtown, exit to Hwy. 15 south, and then shortly exit to I-5 north. Take the Cesar Chavez Parkway exit, turn left, drive SW to Harbor Drive, turn right, proceed to Park Blvd. (just before Convention Center), turn left, parking on your left. Leave your car at home! Parking downtown will be extremely limited; guests are encouraged to utilize public transportation. MTS will provide special trolley service to the concerts. The Gaslamp trolley stop is located a short walk from Embarcadero Marina Park South. Free park and ride parking lots are located along trolley lines, including more than 5,000 spaces at Qualcomm Stadium. 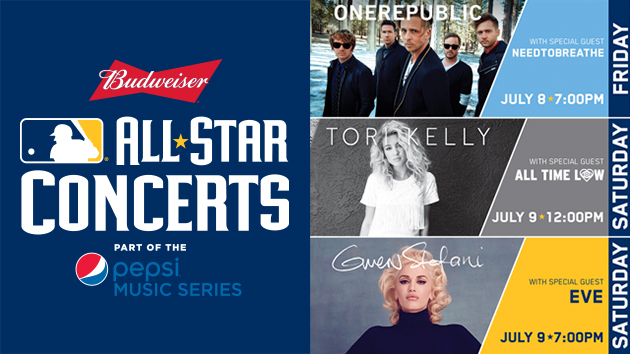 The Budweiser All-Star Concerts, part of the Pepsi Concert Series can be accessed by the Embarcadero Footpath which, moving SE by the water, runs by the Manchester Hyatt, Seaport Village, the Marriot Marina, and a new section down to the Hilton Bayfront hotel. The concert site is just behind the Convention Center by the Bay, on the Marina Park South peninsula. Noisemaking Devices: i.e. Bells, Bullhorns, Whistles, etc. Weapons: i.e. Guns, Knives, Mace, Handcuffs, Nightsticks, Caps, Blackjacks, etc.